Hejazi, T., Soleimanmeigouni, I. (2014). A novel approach in robust group decision making for supply strategic planning. Journal of Industrial Engineering and Management Studies, 1(1), 20-30. T.H. Hejazi; I. Soleimanmeigouni. "A novel approach in robust group decision making for supply strategic planning". 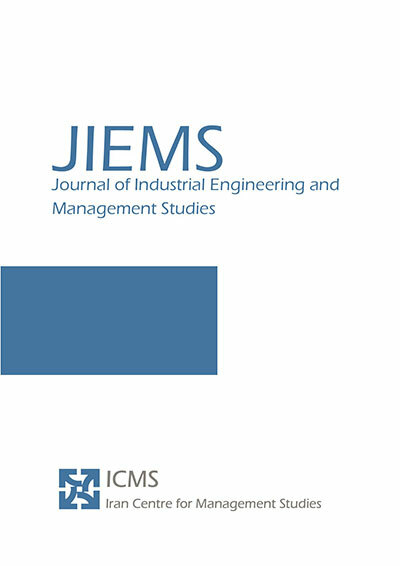 Journal of Industrial Engineering and Management Studies, 1, 1, 2014, 20-30. Hejazi, T., Soleimanmeigouni, I. (2014). 'A novel approach in robust group decision making for supply strategic planning', Journal of Industrial Engineering and Management Studies, 1(1), pp. 20-30. Hejazi, T., Soleimanmeigouni, I. A novel approach in robust group decision making for supply strategic planning. Journal of Industrial Engineering and Management Studies, 2014; 1(1): 20-30. 1Department of Industrial Engineering, Amirkabir University of Technology, Garmsar Campus, Iran. 2Lulea University of Technology, Lulea, Sweden. Long-term planning is a challenging process for dealing with problems in big industries. Quick and flexible process of responding to the existing variable requirements are considered in such problems. Some of important strategic decisions which should be made in this field are, namely the way that manufacturing facilities should be applied as well as assignment and design the system of delivery of orders. On the other hand, by using the small core and big network viewpoint in planning, such decisions should be made in a concentrated way. In this paper, a robust multi criteria group decision making model based on TOPSIS method is proposed, which evaluates the requirements of a real case study. In this regard, firstly important criteria in such environments would be determined. Secondly, using expert’s opinions and statistical analysis methods the group multi criteria decision making model would be constructed. Agarwal, A., R. Shankar, 2006. "Modeling the metrics of lean, agile and leagile supply chain: An ANP-based approach." European Journal of Operational Research 173(1): 211-225. Burgess, T. F. 1994. "Making the leap to agility: defining and achieving agile manufacturing through business process redesign and business network redesign." International Journal of Operations & Production Management 14(11): 23-34. Cánez, L. E., K. W. Platts, 2000. "Developing a framework for make-or-buy decisions." International Journal of Operations & Production Management 20(11): 1313-1330. Capello, R. 1996. "Industrial enterprises and economic space: the network paradigm." European planning studies 4(4): 485-198. Christopher, M. 2000. "The agile supply chain: competing in volatile markets." Industrial Marketing Management 29(1): 37-44. Fischer, D. and U. Hafen 1997. "Immer wieder die gleichen Fehler." Management Zeitschrift Industrielle Organisation 66(6): 38-45. Friedrich, S. A. 2000. "Was ist" Core" und was ist" non-Core." io Management 69(4): 18-23. Humphreys, P., R. McIvor, 2002. "An expert system for evaluating the make or buy decision." Computers & Industrial Engineering 42(2): 567-585. Hwang, C. and K. Yoon 1981. "Multiple Attribute Decision Making: Methods and Applications, A State of the Art Survey." Sprinnger-Verlag, New York, NY. Katayama, H. and D. Bennett 1999. "Agility, adaptability and leanness: a comparison of concepts and a study of practice." International Journal of Production Economics 60: 43-51. Micklethwait, J. and A. Wooldridge 1996. The witch doctors: Making sense of the management gurus, Times Books New York. Miles, R. E. and C. C. Snow 1984. "Fit, failure and the hall of fame." California Management Review 26(3): 10-28. Montgomery, D. C. 2005. Design and analysis of experiments. Hoboken, NJ, John Wiley & Sons. Nagel, R. N. and R. Dove 1991. 21st century manufacturing enterprise strategy: An industry-led view, DIANE Publishing. Opricovic, S. and G.-H. Tzeng 2004. "Compromise solution by MCDM methods: A comparative analysis of VIKOR and TOPSIS." European Journal of Operational Research 156(2): 445-455. Probert, D. 1997. Developing a make or buy strategy for manufacturing business, IET. Vinodh, S. 2011. "Axiomatic modelling of agile production system design." International Journal of Production Research 49(11): 3251-3269.